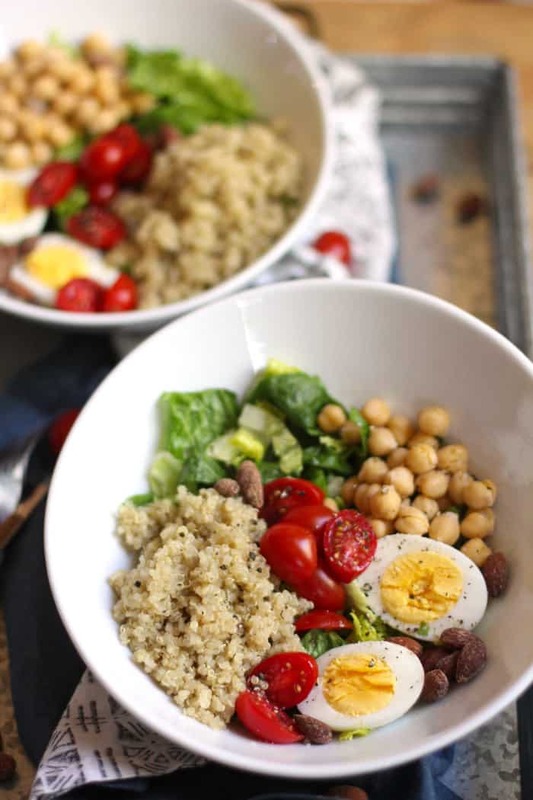 Protein Packed Quinoa Salad is everything you need in one bowl to survive a grueling day. 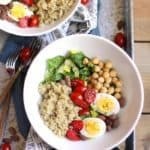 Loaded with healthy greens, and plenty of protein packed super-foods, this salad is incredibly tasty too! Whenever we go away for a weekend and make more than our fair share of food splurges, I always come home craving salads. Eating in excess is okay once in a while, but my body always starts to feel sluggish. I get sleepy and my energy level is zapped. So the Monday after Mike’s Cowtown Half Marathon, I looked in my pantry for anything and everything healthy. I found some quinoa, chick peas, tomatoes, and nuts. Check. My refrigerator contained the other ingredients – the greens and the eggs. Check. All I had to do was to whip up a good healthy salad dressing. And my Creamy Italian Dressing fit the bill perfectly. What does a high protein diet do for you? Keeps you feeling full for longer periods of time. Eggs for breakfast are my go-to. Help balance blood sugar levels. Donuts for breakfast? Nope, never. Makes it easier to build lean muscle mass. That’s why athletes drink protein shakes after a hard work-out. Gives you energy. 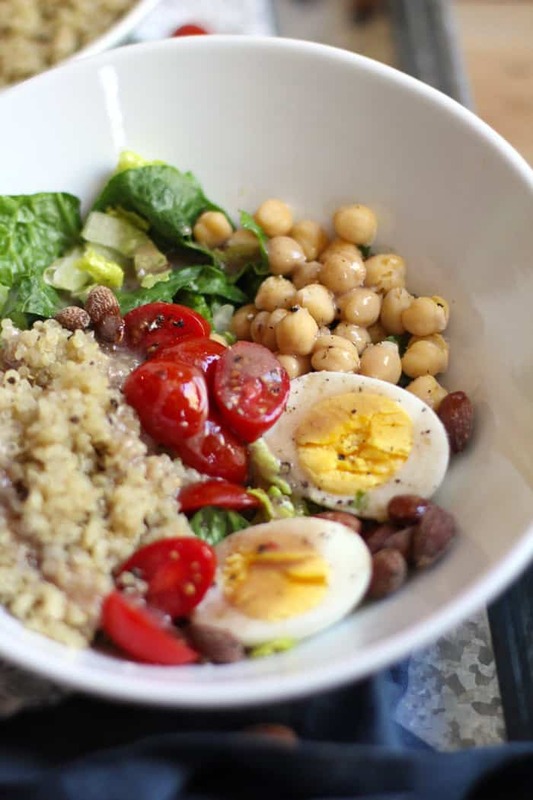 Skip the packaged meals, and make your own protein packed meal instead. 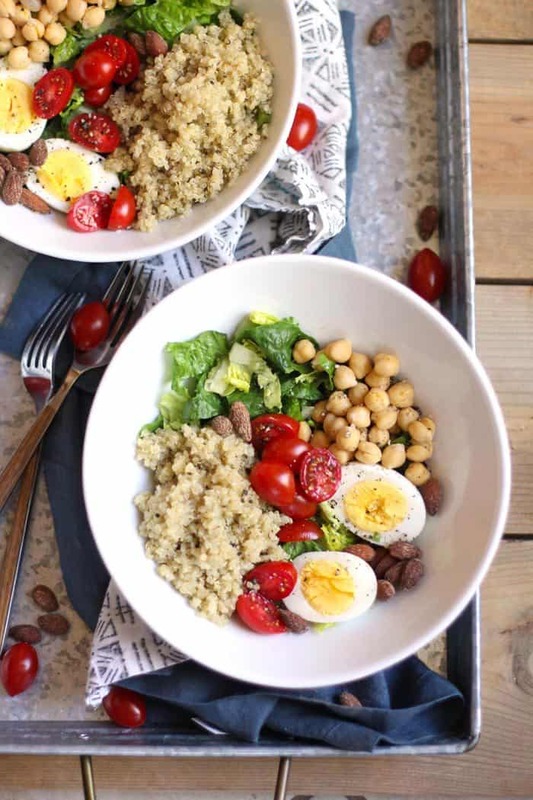 Using smokey almonds in this salad is definitely a huge win. You can find them in any grocery store. Making up a large batch of quinoa ahead of time is key. Store it in the refrigerator and spoon it over your salads all week long. 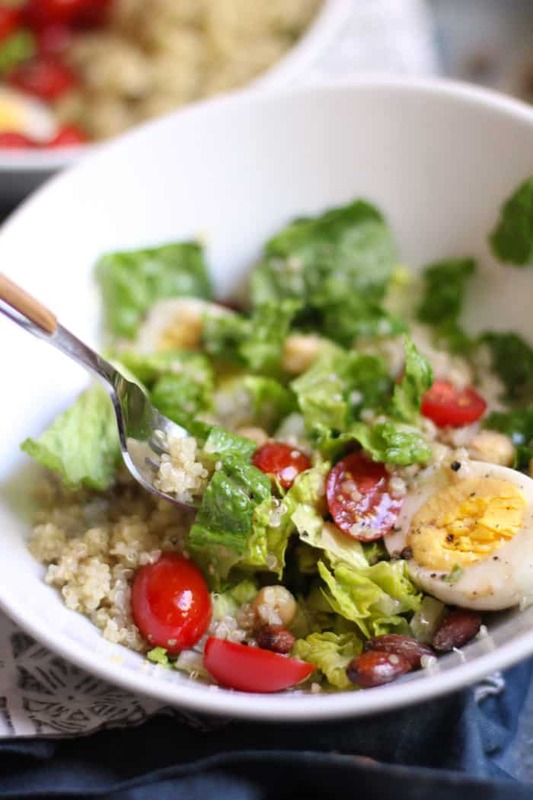 Salad dressings can be so loaded with calories and sugar. My Creamy Italian Dressing is super tasty and has only one teaspoon of sugar in the whole recipe. If using store-bought dressing, watch the sugar. Prep the ingredients. Cook the quinoa according to package instructions, and cool. (I use chicken broth for this.) Boil the eggs, and cool. Rinse lettuce, tomatoes, and chick peas. Pat dry. 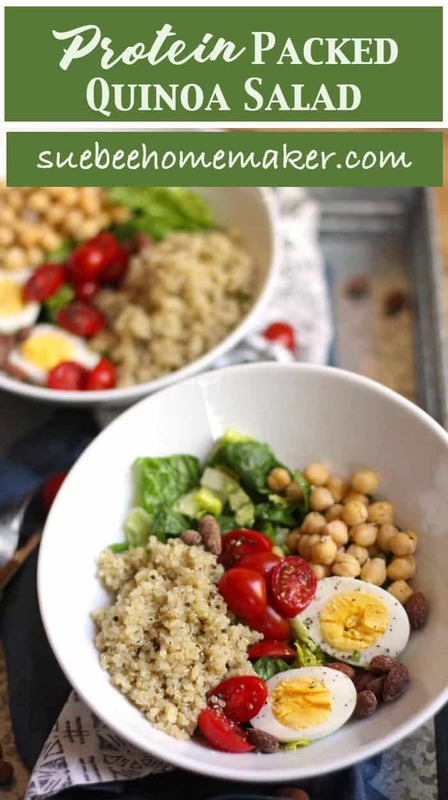 Assemble the salads, by dividing the above ingredients and arranging in four large salad bowls. Drizzle with dressing, and enjoy! This salad is awesome and I enjoy it so much! The combination of ingredients work so well together!